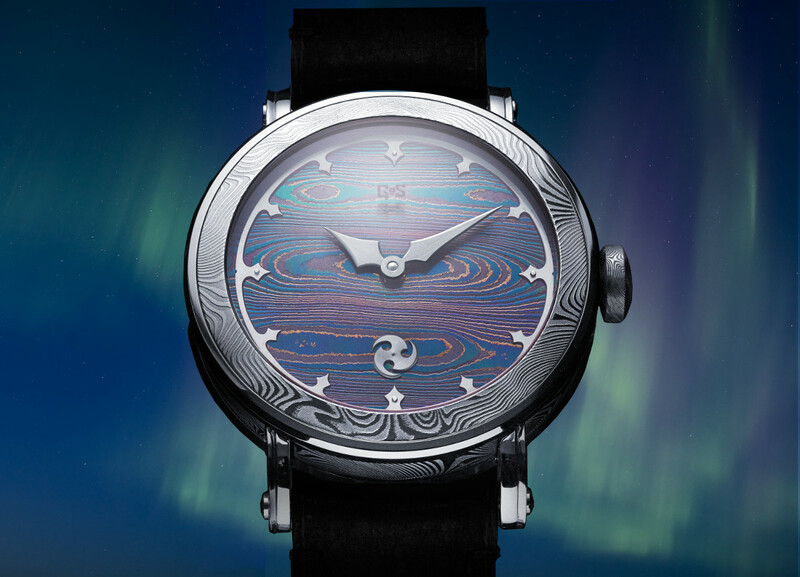 Aurora is strictly limited edition watch inspired by the Northern Lights of Lapland. The Northern Lights or Aurora Borealis, named after a Roman goddess, is a natural phenomenon where colorful lights swirl around the sky in a dramatic dance, leaving different patterns and shapes. Sometimes the shapes appear as fold upon fold of luminous draperies that majestically move across the sky. Other times they are like gigantic flaming swords furiously slashing at the heavens. 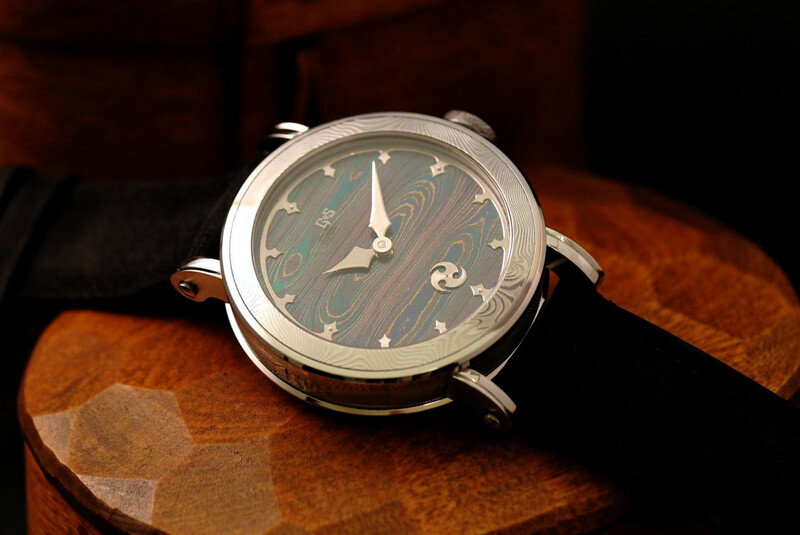 Aurora’s Damascus steel dial has been tempered to a blue-green color and the flowing colored lines are framed by bright streaks. 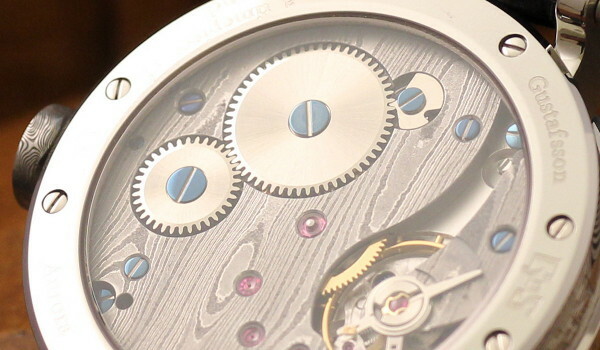 The white gold dial details and hands match the highlights on the dial. 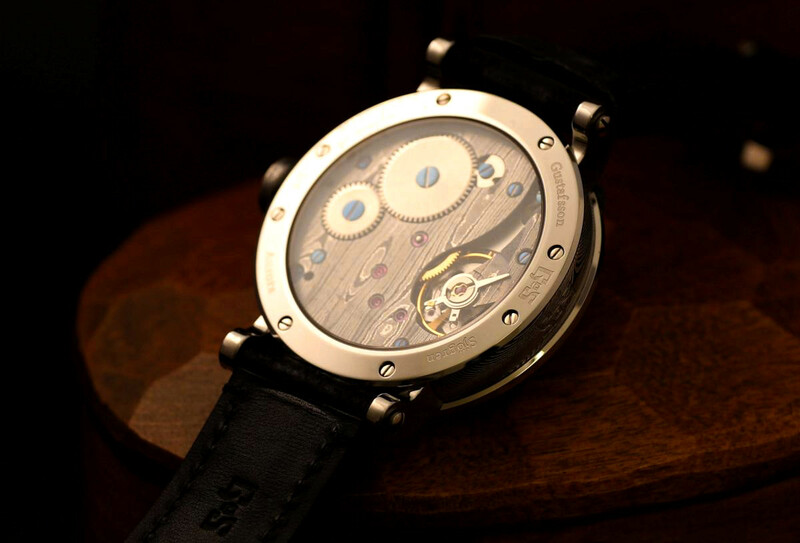 The movement is based on a chronometre grade Unitas 6498 that has been modified with 3/4 bridges made from one solid piece of handforged damascus steel. The steel pattern is similar to the woodgrain pattern that is used for the GoS caliber. Both Johan and Patrik appreciate contrasts in designs and patterns, which is why Patrik chose to give the bridges a combination of traditional movement finishing on some surfaces and a more raw damascus steel on others. Traditional high end movement finishing is time consuming. A similar amount of work is required to achieve the raw damascus steel surface. The bridges are mirror polished before the pattern is made visible by dipping the part in hot acid. The acid eats away from the surface of some steel types that has been forged into the patterned steel while others are not affected. This means that all surfaces where tolerances must be kept also have to be protected from the acid. The finishing continues after the etching procedure to give back some brightness to the pattern and increase the contrasts in the pattern itself. The polished bevels and holes are then finalized after the damascus steel surface is done. The Aurora case features the same finishing improvements on the damascus steel case that GoS developed for the Midnight Sun model. It has the familiar curved surface of the damascus steel case´core, which pattern is mirrored in the high gloss, polished large case back and bezel. The curved lugs and a low height makes the watch comfortable to wear even though it is 45mm in diameter. The damascus steel cases are individually finished in a process Patrik initially developed for Nordic Seasons and Winter Nights. It involves two etching procedures in hot acid and refinishing in between. It is only the visible parts of the case that are exposed to the acid to ensure that the case will have the same water protection as before the treatment. The hands of the Aurora are made in solid white gold and have the GoS sword shape that once premiered in the Stockholm model. All hands and index rings are hand finished with polished bevels and satinized top. These handmade GoS Nubuck straps are fitted with screwed lugs and are paired with a stainless steel GoS buckle. 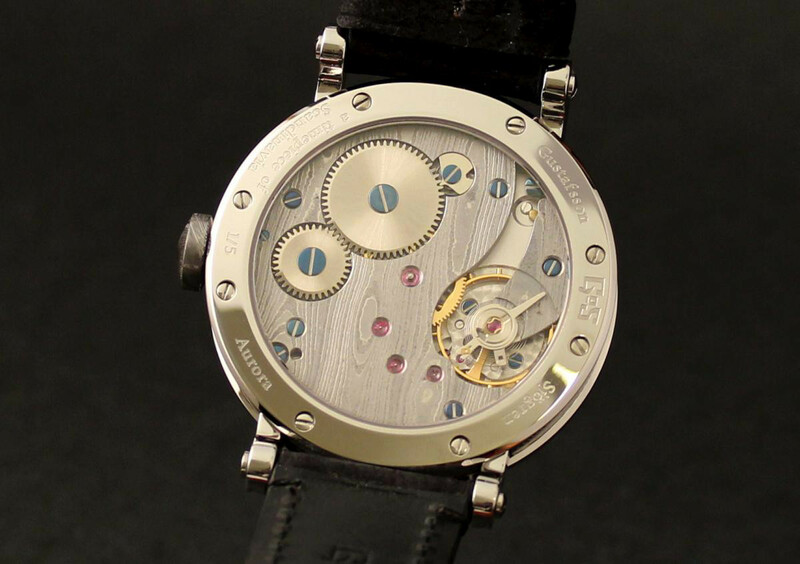 Movement customization: Bridges made from one piece of solid damascus steel. 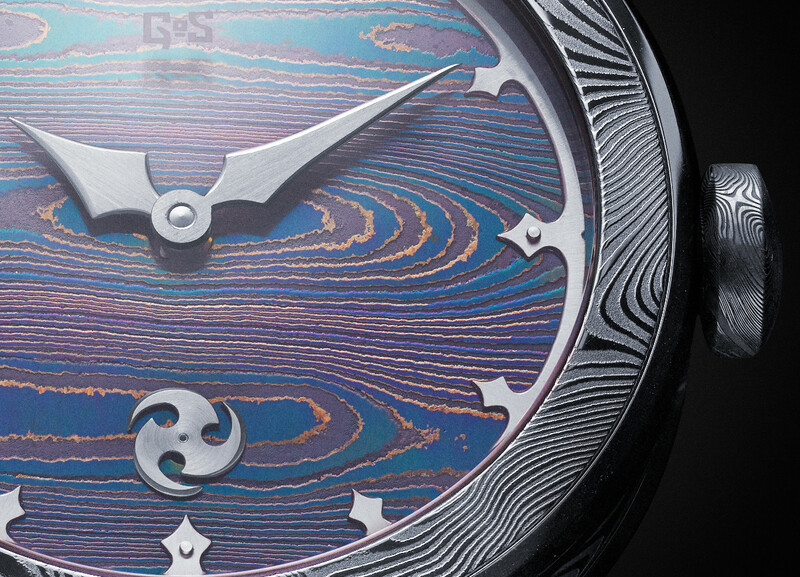 Dial: Damascus steel tempered to a blue/green color. Case finishing: Stainless damascus steel, high gloss polished with GoS logo engraved on case side. Aurora No1 of five is the watch on the majority of pictures below and has been sold. However, No3-5 are available for pre-order.